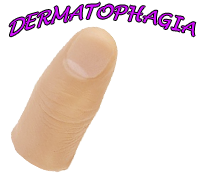 Dermatophagia is an anxiety disorder in which patient bite or chew his skin when he is mentally disturbed. People do it repetitively without hesitation and cannot stop himself from biting. Sometimes patient feel embarrassment in public while chewing and biting his skin around nails. So they want treatment and try their best to get rid of this disorder. Patients also get worried about their skin scars and bleeding. Here are some remedies which can help patient to get rid of this disease. Cognitive behavioral therapy helps a lot. in this therapy patient is in a counseling session with physician and tells him all about his problems and this disease. Due to counseling sessions of cognitive behavioral therapy patient feel relax and learn about positive and negative things he do. So he tries to respond to those negative and positive things. Cognitive behavioral therapy is considered most suitable therapy for two psychiatric conditions i.e anxiety and obsessive compulsive disorder. So cognitive therapy is widely used therapy for this dermatophagia. 2nd option include habit reversal therapy HST. This therapy is suitable for patients having repetitive habit of any action. In this therapy, consultant or counselor tries to change thinking of patient from negative side to positive side. This therapy have specific treatment components like training about awareness, reward of behaving well and social support, patient training of response for competition. Another trick which helps in reducing this disorder involve covering of tips of fingers. When fingertips are covered with anything, patient will avoid biting them and as a result this habit will cut off completely with time. People around patient like a special person (life partner or girlfriend/ boyfriend and parents and friends) can help him getting rid of this disorder. These people can help patient to relax by diverting his mind in other things. The anxiety level of patient drops as a result. These people can also remind patient about good and bad actions. Setting alarms in a unique way also help patient to get recover completely. Patient should try to keep his mouth and hands busy in working most of the time. By doing so, there will be less chances of dermatophagia occurrence. Patient can try to talk with people if he feels like biting his fingers. Patient can play games like sudoku to make his hands busy. He can do knitting and chew gum instead of chewing his skin. Females can cook and be busy most of the time. Females can also get a manicure like it become less appealing to patient for biting. Other than above mentioned tricks, patient can apply bitter nail paints on nails that will keep patient away from biting skin around nails. Patient can also apply a nail paint with foul smell.It will work same as bitter nail paint. Patient will not bite or chew his skin any more.Last but not least, patient can wear mouth guards to avoid biting or chewing his skin around the nails.